'FIRST THINGS FIRST' is a performance piece, written and directed by interdisciplinary artist bello benischauer, presented in the postdramatic and experimental style of his Existence Theatre Productions, performed by Elisabeth M Eitelberger, Helah Milroy, Jemma Fleming and Ross Hamilton. Duration: approx. 70 min - no interval. About: Four people in couples try to sort out their lives but have one thing in common, they share the dream of a journey to escape the conflicts of reality. Different scenes give insight into some of their daily, more or less dramatically unfolding encounters. Two different kinds of relationships seem surreal at times, their worlds touch only briefly at one point. Aggression, suppressed feelings, victimisation and dominating the other besides feeling small and unloved are all part of their explorations, which could either escalate or just drag on, leading nowhere. There are gender issues and traumatic experiences, which stay unclear of nature but obviously impact their present actions. There are backflashs of awkward situations at the doctor's, the therapist's, the police station, at working different jobs. Everything told and shown outlines 'something that happened' and more than one metaphor unfolds. 'First things first' plays with one's individual imaginations and how interpreting perceptions are informed. Personal experiences and the Media contribute to what choices we make, how we act. 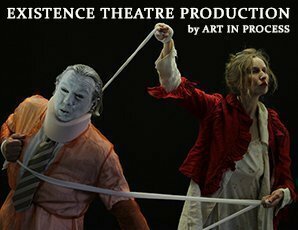 With their newest production 'Existence Theatre' once again reflects on urgent socio-cultural issues in present-day society and asks questions about how ignorant or aware we are about our human existence. Although 'First things first' has an open ending, it is clear that voicing our concerns and confronting us directly with issues that bother us is something that needs to be played out in real time. This way we can move forward and become ourselves in society to live, to experience, to dance. Ticket price includes a cup of mulled wine with the artists afer the show. Latecomers will not be admitted. Mobile telephones and electronic devices are to be turned off during the performance. Cameras, video cameras and tape recorders will not be permitted. No complimentary tickets or free passes can be used for this performance. Please note that this venue has no wheelchair access!